Turn your everyday expenses into everyday joy with Citi Cash Back Platinum Credit Card. Not only do you receive up to 11% cash back when spending on certain daily essentials, you'll also receive 1% cash back on all other retail spending. So stop comparing and get the cash back credit card of choice today. Faster and more convenient way to pay with Visa payWave. Free 24-hour personal assistant service. Receive 1% Cash Rebate for every THB 800 spent/sales slip at Shell Gas Stations nationwide (Max. THB 1,600 /sales slip and THB 4,800 /month). Registration required by typing GAS followed by last 12 digits of your credit card number and send to 4712228 (THB 3 /SMS). Today - 31 Mar '20. Get 15% Discount! when paying for your Grab services via Citi Cash Back Platinum credit card, and entering promotion code "CITI15"
This marketing program is reserved for domestic services only and not applicable for "Advance Booking", "GrabFood" and "GrabBike". The amount after discount will be calculated for 5% rebate upon card's benefit conditions. Limit maximum discount at THB 70/time and 5 times/acct/month (total 100 privileges /day). Today - 31 Mar '19. Travel accident insurance coverage of THB 7,000,000 per card when purchasing the ticket via the card. Flight or luggage delay coverage of THB 7,000 per card member. Luggage lost coverage of THB 24,500 per card member. Remark: The coverage terms and conditions, exclusions, and the initial expenses which are the responsibility of the cardholders are dependent on the insurance policy issued by the insurance company through Lockton Wattana Insurance Brokers (Thailand) Ltd. For more information, please call 098-249-5657098-249-5657. Please click here for promotion terms & conditions. Promotion is starting now - 30 June 2019. Enroll for eStatement by the first cycle. Spend 5,000 Baht within 30 days after card issuance. Citibank reserves the right to offer this promotion only to those who have never been a Citi Credit Card/Ready Credit member and/or who have cancelled their membership with Citi Credit Card/Ready Credit for more than 12 months. This condition does not apply to Citi Prestige and Citi Royal Orchid Plus Preferred credit card members who have paid upfront annual fee. Premiums, Reward points, and cash rebate will be uploaded within 4-8 weeks according to the terms and conditions. Premiums, Reward points, and cash rebate are limited to one item per qualified primary card members. Premiums, Reward points, and cash rebate are non-refundable and non-transferable after Card member's acknowledgement. Citibank reserved the right to change promotion or gift without earlier information. Citibank reserved the right to change stock-out premium with the same value without prior notice. In the event of disputes, Citibank has the absolute right to make the final decision. Please check promotion details prior to applying. Complete the short form and click "Submit"
*Annual fee do not include VAT. **There is no annual fee charged on both Basic and Supplementary Card once the combined spend of both cards reached criteria of conditional fee waive. Click here to view other Citi Credit Cards. Cash rebate is not applicable for retail spending on cash advance, mutual fund, land transfer fee, utility (electricity and water) as well as spending at gas stations, Makro, Payment Transactions via Citibank Online and cancellation of goods and services (domestically and internationally) or any type of tax refund, interest and fees. 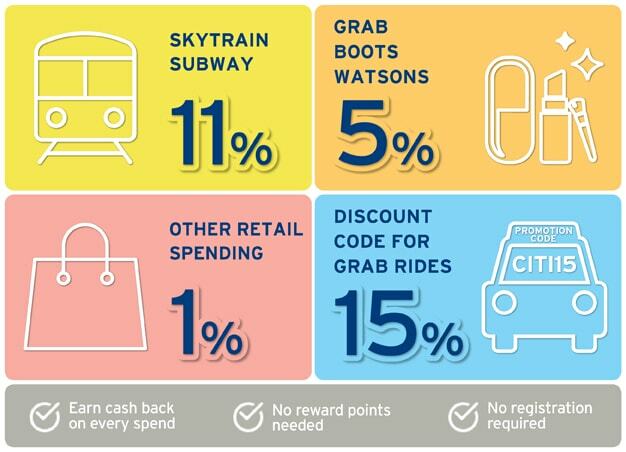 The 11% rebate on your domestic transactions at Skytrain, Subway (all domestic electric trains except Airport Rail Link and Rabbit LINE Pay transactions) (Today - 30 Jun '19) and 5% rebate on your domestic transactions at Grab, Boots and Watsons (Today - 31 Dec '19), will be credited to your statement by next month with limited maximum of THB 500 per month (Skytrain, Subway, Grab, Boots and Watsons combined). For 1% rebate on other retail spending, every THB 100 of accumulated cash back in a month will be automatically credited to your statement with limited maximum of THB 2,000 per billing cycle. Travel accident coverage up to THB 7,000,000 per card for tickets purchased through Citibank Rewards card. Coverage of THB 7,000 per card member for delayed flight or luggage. Coverage of THB 24,500 per card member for lost luggage.